Winner Poker is a great poker room within the iPoker network. You can play in your browser (Flash plug-in needed) or download a poker client. Winner Poker is a part of the iPoker network, a very popular poker network that includes poker rooms such as Titan Poker, Everest Poker, Betfair Poker, Ladbrokes Poker, Dafa Poker, and many more. 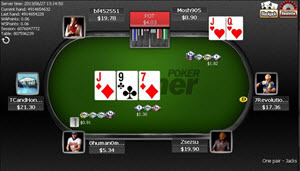 Examples of poker variants available for players in this network are Texas Hold’em, Omaha, Omaha HiLo, Razz, 7 Card Stud, 7 Card Stud HiLo, and 5 Card Stud. The iPoker Network arranges a series of online poker tournaments called the iPOPS. At the time of writing, the next iPOPS Main Event will have a €250,000 guaranteed prize pot. Just like all members of the iPoker network, Winner Poker use poker software created by Playtech. The client is easy to use and quick to download and install. Playing in your browser is also a breeze, but you have to do without some of the features included in the downloaded client. The iPoker network has a lot of traffic. At the time of writing, only PokerStars, 888 Poker and Bodog have more traffic to their cash game tables. Your first deposit is matched by 100%, up to maximum of $500. Check all the latests bonuses and offers at www.winnercasino.nu since they sometimes have unique bonuses for each type of game. There is always something going in here, either arranged by Winner Poker or by the iPoker Network. If you are a new member, look out for the special beginner events. In addition to poker, the Winner gambling site offers sports betting, bingo, casino and live casino. The Winner Poker support is staffed 24/7 every day of the week. You can call the support, use the live chat or send an email.